The mayor of Paris has unveiled a new glass floor at the Eiffel Tower, Paris' best-known landmark, offering visitors a new perspective on the city from a height of 57 metres (187 feet). Visitors look down through a solid glass panel on the first floor of the tower, offering a dizzying sensation of walking on air. 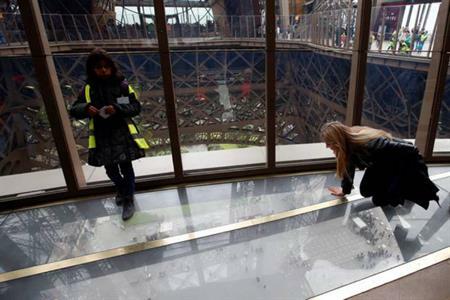 Previously the first floor was the least visited part of the Eiffel Tower, but the attraction's operators hope the glass floor will encourage tourists to linger on their way down for more breathtaking views of the city. The new installation is part of a €30m refit that includes new solar panels and a museum, with a display detailing the history of the 125-year-old tower on seven screens. A conference room is also available.